One of the features that keeps many people from building the Kitty Hawk F-35B kit is the need to paint on all those RAM panels. RAM is radar absorbent material that is placed, in tape form, over all the various maintenance panels on stealthy aircraft. This is the same material with which the entire jet is painted and designed to not only absorb, but also to reflect incoming radar beams. This has the result o f making a relatively large aircraft either electronically invisible, or to appear to be something like a small bird. Well now those who dread having to do all that masking to properly duplicate this stuff have an easy way to deal with this. 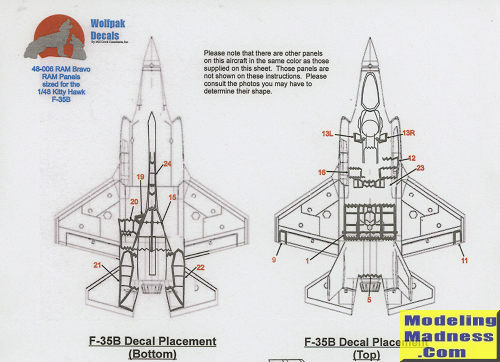 Wolfpak's sheet is designed specifically for the F-35B and will not properly fit the F-35A or F-35C. The set is in dark gull grey, which closely approximates what the real deal looks like. 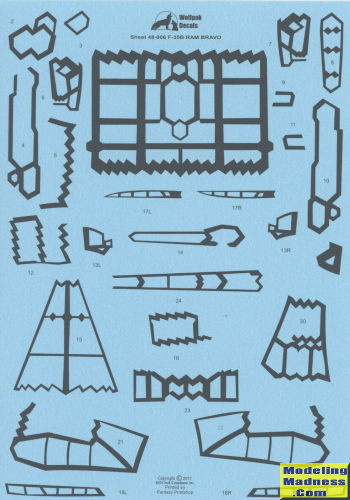 The sheet has enough panels for one plane and includes an extensive placement diagram to ensure you get every one in the proper place. If you are thinking that this looks the same as that for the F-35A sheet, well only about the top 1/3 is the same. The rest is quite different. Well worth picking up and a real time saver to boot. Thanks to WolfPak Decals for the review sample. You can order yours direct via Paypal using sales@millcreekconsultants.com for the reference.